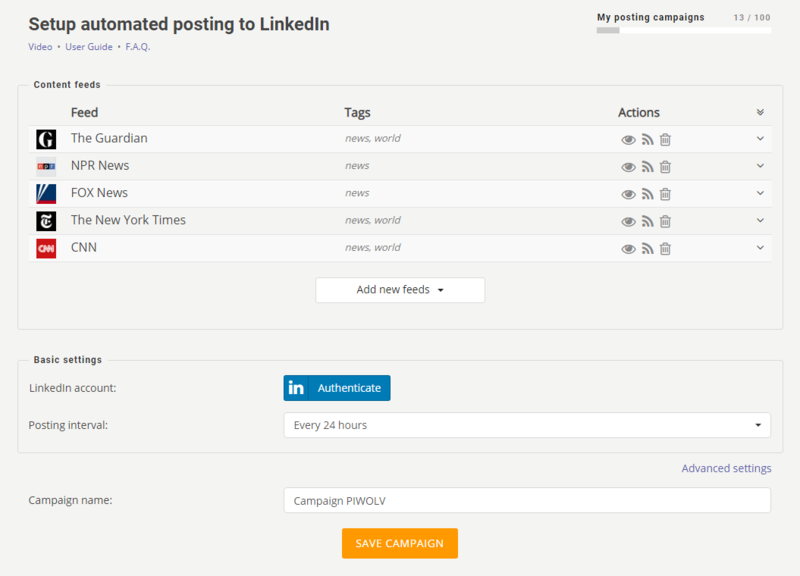 LinkedIn Poster allows automatically share content from content feeds to your LinkedIn pages. 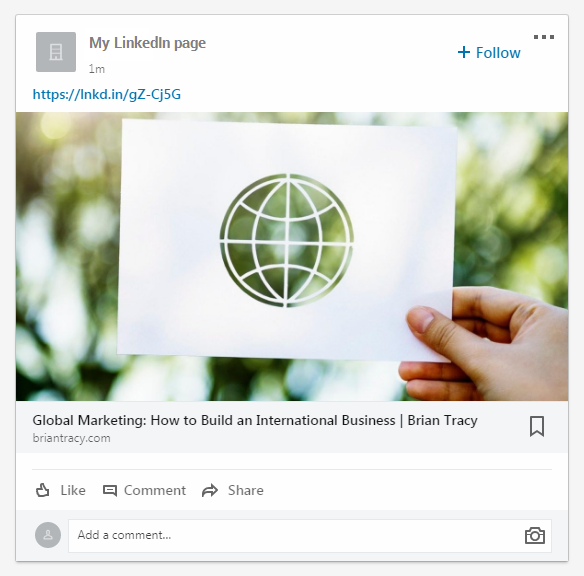 To start sharing content you need to set up a LinkedIn posting campaign. To be able to create a LinkedIn posting campaign you need to sign up for any of RSS Ground membership plans. First thing you have to do in Basic settings is to Authenticate your LinkedIn user. Press Authenticate button, follow the steps and grant our app all requested permissions. As soon as your LinkedIn user is authenticated a " Send posts to" option will appear. In the drop-down, you will see a list of all LinkedIn pages you can make posts to. You can select only 1 posting destination if you have Basic membership, and up to 3 - if you are on a paid membership. Same posts will be sent to all selected destinations simultaneously. Please use "Search" option if you have a long list of pages. All your Facebook posting campaigns are saved in "Posting Campaigns" section of MY ACCOUNT. 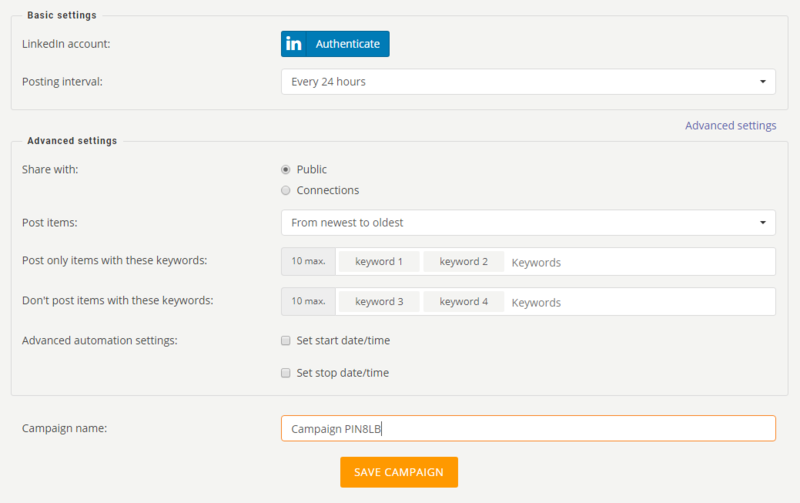 See our another user tutorial on how to manage your created posting campaigns. Share with - choose if you want to make your posts visible publicly or only to your 1st level connections. This option will only work with updates of your personal LinkedIn news feed. If you wish to post only recent content to your LinkedIn pages, you are recommended to use "Only new" option. If you wish to ensure the gradual update of your LinkedIn pages, you are recommended to use "From newest to oldest" option.